The US has 800 military bases in 63 countries worldwide, and military personnel presently active in 156 countries. 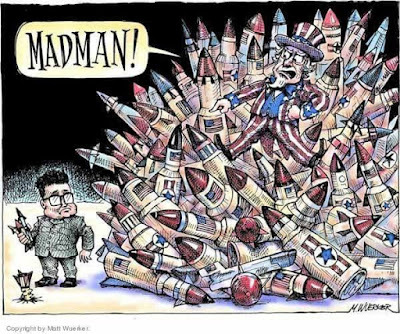 The US has been at war or in a military conflict for 224 of its 241 years in existence. The US defense budget is over $610 billion yearly, which is higher than the defense budgets of the next 8 countries combined: China (215), Russia (69), Saudi Arabia (63), UK (48), France (55), India (55), Japan (46), and Germany (41). The US is the only country that has ever dropped an atomic bomb on a population, killing about 200,000 people in Hiroshima and Nagasaki. A December 2013 WIN/Gallup poll asked 67,806 respondents from 65 countries, "Which country do you think is the greatest threat to peace in the world today?" 24% of respondents said the US. The next highest perceived threat was Pakistan at 8%. 5% believed North Korea was the greatest threat. 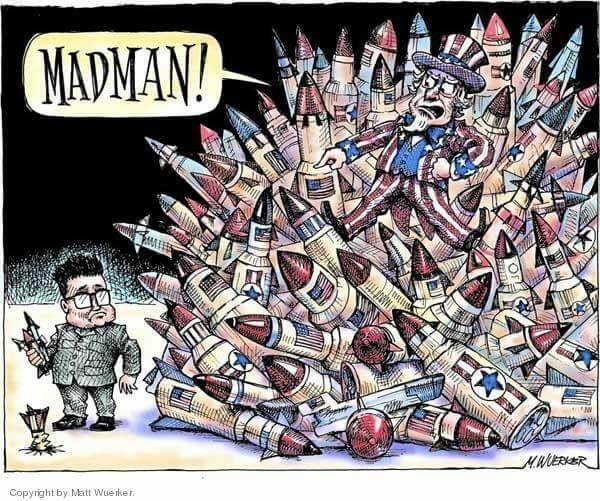 The US has 6,800 nuclear armaments. North Korea has less than 10. The US has overthrown or attempted to overthrow 57 foreign governments since WW2. North Korea has overthrown or attempted to overthrow 0 foreign governments since 1953. ........Pretty much about sums up the "conflict."